Hard water is water with high concentrations of magnesium and calcium particles. Though these particles do not pose a threat to your health and safety, they can wreak quite a bit of havoc on your plumbing system and appliances. Long term exposure to these mineral particles will lead to limescale build-up, restricting water flow and causing damage to your pipes as it hardens. A rapid build-up of soap scum might suggest that you have hard water in your home. The minerals found in hard water prevent soap from dissolving, causing it to stick around after your bath or shower. Have you ever looked at your glassware after running your dishwasher and noticed little water spots along the surface? Water spots are the result of mineral residue left behind from hard water. Calcium and magnesium build-up in your dishwasher can negatively impact its function by restricting the flow of water in and out of the appliance, leading to damage and ineffectiveness. This is a tell-tale sign that you have hard water in your plumbing system. The same mineral deposits that you see outside of your pipes are likely accumulating inside your pipes. When this limescale hardens, you will likely need to replace your pipes much sooner than later. Mineral deposits can end up clogging your showerheads, which makes for a not-so-great shower experience. Over time, the showerhead can become so clogged that no amount of water will be allowed through, leading to a need for replacement. Hard water can leave a residue on your hair and skin. Your hair may feel slimy, lack volume, or be hard to style after it has been dried. You also may notice that your skin feels dry. This is because the minerals in hard water are likely diluting the shampoo or body wash you use, reducing their effect on your body. Just as it prevents soap from dissolving inside your bathtub, hard water can have the same effect inside of your washing machine. This can prevent clothes from rinsing off or can make them stiff after they come out of the dyer. It can also cause colors to fade much faster than they would have otherwise. 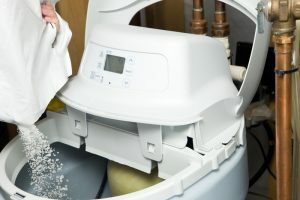 Call a plumber for water softener installation services! A water softener will help reduce minerals found in the water supply, thus mitigating the effects of hard water on your plumbing system. For more information, contact Modern Plumbing Industries, Inc.